Although I wrote up a whole separate beauty gift guide, I decided to put aside a few beauty related items for this guide too. These beauty favourites are more for the everyday girl, and they’re products that would suit anyone – no matter their age, style or skin type. I’ve also included some home, lifestyle and fashion pieces too, so this is definitely more of a mixed guide with gifts that would be loved by any girl. Starting off with skincare, the Glossier Supers Set is one of my ultimate skincare finds of the year. The kit includes three full size serums, each tailored to different skin related issues that we all suffer from time to time. Super Glow is the perfect morning skin booster, Super Pure is great for any breakouts or redness and Super Bounce is a surge of moisture for days when things are looking a bit lack lustre. I wrote a whole post dedicated to Glossier a couple of weeks ago which I’ll link here for a more in-depth review. The Pixi Its Eye Time Eyeshadow Palette* is one of the most versatile palettes I’ve seen this year! It has soft, buttery shades that work really well for a glowing eye look that accentuates features in such a stunning way. For something a little more luxe, and still extremely festive, the Charlotte Tilbury The Vintage Vamp Palette is the perfect luxury shadow quad for all the parties this season. I love the pigmentation of these shadows and the foiled formula is so dreamy! This is the third quad from this line that I own now and I love it to pieces. Pixi has such a great festive selection this year so I’m featuring another product from their line – the Pixi + Maryam Maquillage Strobe & Sculpt Palette* is a wonderful gift for anyone who is beginning to venture into the world of contour and highlight as it’s such an easy and versatile palette to use. Onto more lifestyle present ideas – marble is always such a chic print and makes a gift feel super luxe. 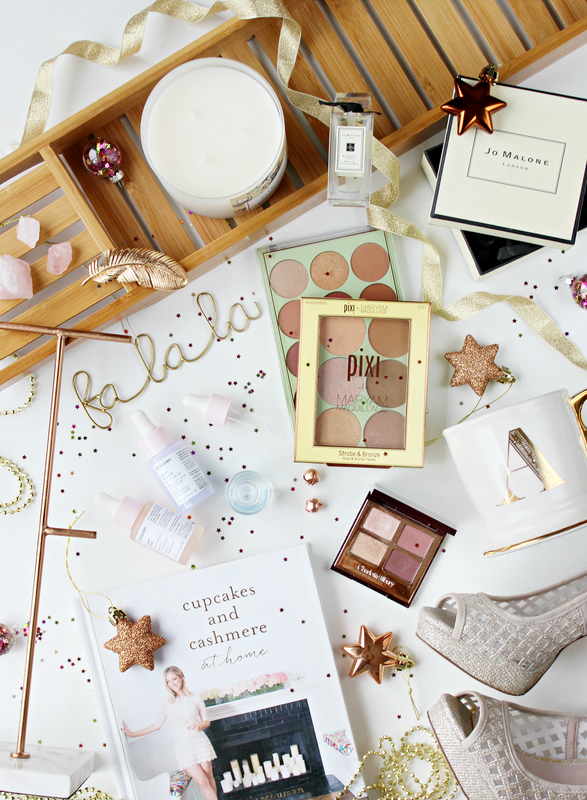 I found this Marble & Copper Jewellery Stand in Asda and I’m totally smitten, it’s tall and stylish and very on trend – plus, it works as the perfect gift for the girl who has it all. Anthro is always a great stop for gifting because everything is extremely special and the store seems to have something for everyone. Their Monogram Mugs are always extremely popular and make a very personalised touch to a regular mug. They also have a gorgeous selection of hair accessories such as this Hair Barrette which looks stunning and would make the perfect addition to any New Years outfit. 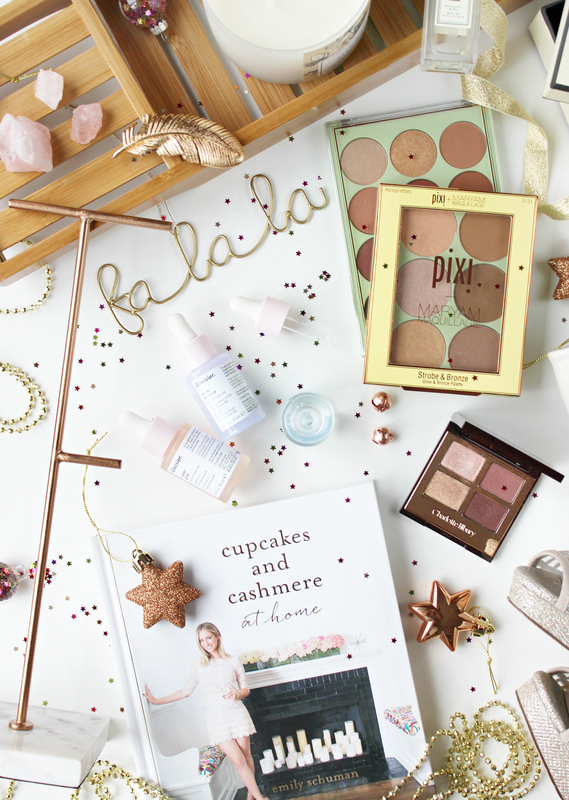 Pampering treats are definitely very well received by many and a selection of bathtime goodies would be perfect to put together for a spa night post-Christmas season. I’ve been enjoying the Bath & Body Works Candle in Almond for the past few days and it would make a great affordable present for someone who loves home fragrance. A more luxury option is the Jo Malone Blackberry & Bay Bath Oil which I’ve also been using for relaxing winter baths. The scent is perfect for this season and it comes packaged so beautifully! On the bathtime theme, a more unorthodox gift is something like a Bamboo Bath Tray – it makes the perfect addition to the bathroom with a spa-like feel, especially when you pair it with some bath oils and salts. Previous Post Gift Guide: For Him.